(figuratively, informal) Short for 鴨嘴器／鸭嘴器 (yāzuǐqì, “speculum used in gynaecological examinations”). 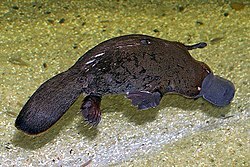 鴨カモノ嘴ハシ (kamo no hashi): the duck-billed platypus. 鴨嘴 (kamo no hashi): the seed head of the smutgrass plant. Compound of 鴨 (kamo, “duck”) +‎ の (no, possessive particle) +‎ 嘴 (hashi, “bill, beak”). The の (no) is omitted in the spelling. The platypus sense is a partial calque of English duck-billed platypus. Ō perī kamo no hashi perī! Oh, Perry, Perry the Platypus! As with many terms that name organisms, this term is often spelled in katakana, especially in biological contexts, as カモノハシ.